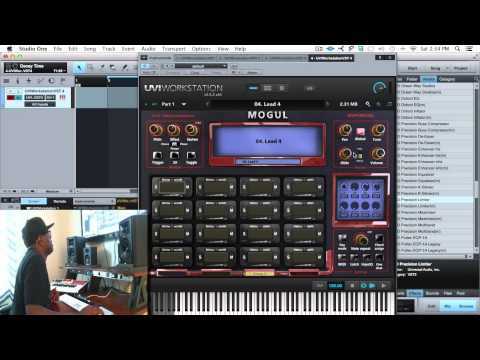 MOGUL is an incredible new virtual instrument great for both in studio work or on stage in a live performance setting. Sporting a 16 pad, 4 bank customized interface with one of a kind features this product is perfect to pair up with both your keyboard and pad controllers with easy one touch automation to control MOGUL's powerful features. 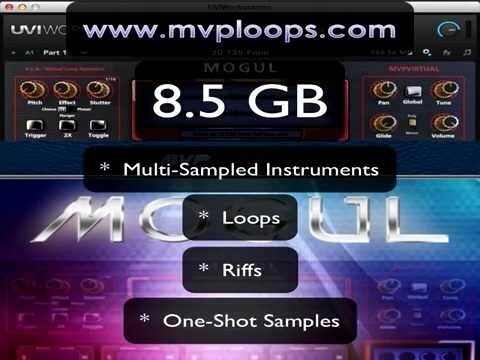 MOGUL is a triple-threat software that features the critically acclaimed V.L.X. engine designed for the modern producer, performer, and DJ in mind! Take control of your productions with the power of multi-sampled instruments, loops, riffs, and one-shot samples all in one easy-to-use software plug-in. MOGUL was developed by a multi-platinum, awarding winning team of producers, engineers, sound designers, and musicians to give you current sounds that are killing out the charts today! MOGUL gives you 8 gigs of platinum content including thousands of samples in one package with onboard effects organized in a smart way to make your work-flow faster no matter how you choose to produce. There are 125 painstakingly tweaked and layered multi-sample instruments separated into 9 separate categories including bass, keys, synths, leads, pads, brass, strings, stutters, and arps! Next up is 20 huge construction kits that not only have all of the loops, but we have also given you tons of cut and chopped riffs, and one shots giving you endless creation options. Let's talk Effects & Exclusive Features! Developed on the world-renowned UVI sound engine, MOGUL features a wide range of on-board effects including HP/LP Filters, Reverb, Delay, Distortion, EQ, Compression, Modulation Effects, and a Modern Stutter Effect along with enhanced production workflow features like Note Repeat, Chord Assign, Glide, Key Assign, and Sample Exchange that allows you the ability to create your own customized kits, or replace individual samples for completely original music productions. STRETCH ME TO THE MAX! Time stretching is crucial in today's music. MOGUL does not disappoint. Stretch loops to the max with our advanced time stretching enhancement so that you never have to compromise. This is a feature not even offered on some of today's most popular padded production workstations. It doesn't matter whether you are creating Trap, R&B, EDM, Pop, Soul, or Gospel MOGUL is going to have something special for you. It's a diverse product and easy to tweak allowing you to really expand it capabilities as far as your creative mind can take you. Demos were created using both construction kits and multi-sampled instruments inside of MOGUL. MVP Loops products purchased and or downloaded from any MVP Loops distributor. written permission of MVP Loops.